I’ll begin with the fact that I love eating breakfast! With that being said, no I don’t eat quiche everyday, even though that sounds like a divine life. I’m not quite sure how my love of quiche even manifested… but its my go-to breakfast dish. Whether I’m attending a MOPS meeting and have to bring a hot dish, making brunch or just want something delicious for home. This recipe does NOT disappoint. I found this quiche recipe from an episode of Pioneer Woman that I watched and knew I had to make it. This quiche is called “Cowboy Quiche” and my husband and everyone who has eaten it have loved it! I love that you just need a few ingredients: Eggs, Butter, Onion, Bacon, Heavy cream, Cheese, and a pie crust. Ingredients and printable directions are listed at the bottom of the post. First you cut up an onion, and sauté them until they are a gorgeous golden color. You will cook them over low heat for about 15-20 minutes stirring them on and off. When they are done set them aside to cool. Cook 8 slices of bacon, and then roughly chop them up. Don’t get them extra crispy while you are cooking them, you want them somewhat chewy because they are going in the egg mixture and will cook some more in the oven. Be sure to have some extra slices on hand for snacking, I’m talking about you or any tiny hands. Somehow bacon disappears in my house, I’ll let you decide if its from adults or hungry boys. Roll out your pie dough, or grab your prepared pie crust you have from the store. I always keep a couple in my freezer to have on hand for pies, quiche, etc. Just let it thaw for a bit and then roll it out. Lay the crust over your pan, and use a DEEP DISH pan for this recipe. It makes a lot of quiche and you’ll want to use a bigger pan for one quiche. I have a Martha stewart pan thats extra deep that I used. You can use two regular pie crust pans and bake two (freeze one, or eat two, no judgement) you can see how the Martha Stewart one I used is wider and deeper than a regular pie pan. Throw your onions and bacon into the egg mixture, add cheddar cheese (try not to drool into the mixture) and then pour into the pie dish with your pie crust. Bake at 400 for 40 to 45 minutes, with foil lightly tented over the top. Take the Foil off and cook for 10-15 minutes more until the crust is golden brown and the center is slightly still jiggly. It will continue to cook when you take it out of the oven. If it looks like it needs more baking time, just pop the foil back over the top so the crust doesn’t get too dark and let it keep baking. Let it rest for 15 minutes after you take it out of the oven before you slice it. Enjoy this amazing dish, and print it out down below. Fry the onions in the butter in a large skillet over medium-low heat for at least 15 to 20 minutes (maybe longer), stirring occasionally, until the onions are deep golden brown. Set aside to cool. Fry the bacon until chewy. Chop into large bite-sized pieces and set aside to cool. Preheat the oven to 400 degrees. Roll out the pie crust and press it into a large fluted deep tart pan (or a deep dish pie pan). Whip the eggs, cream, salt and pepper in a large bowl, then mix in the onions, bacon, and cheese. 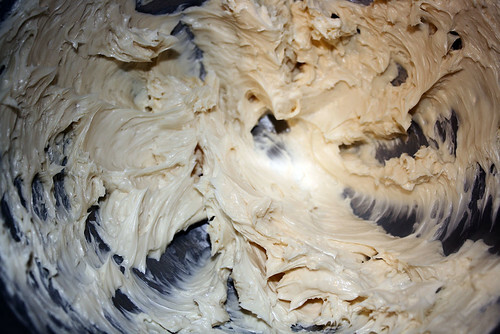 Pour the mixture into the pie crust. 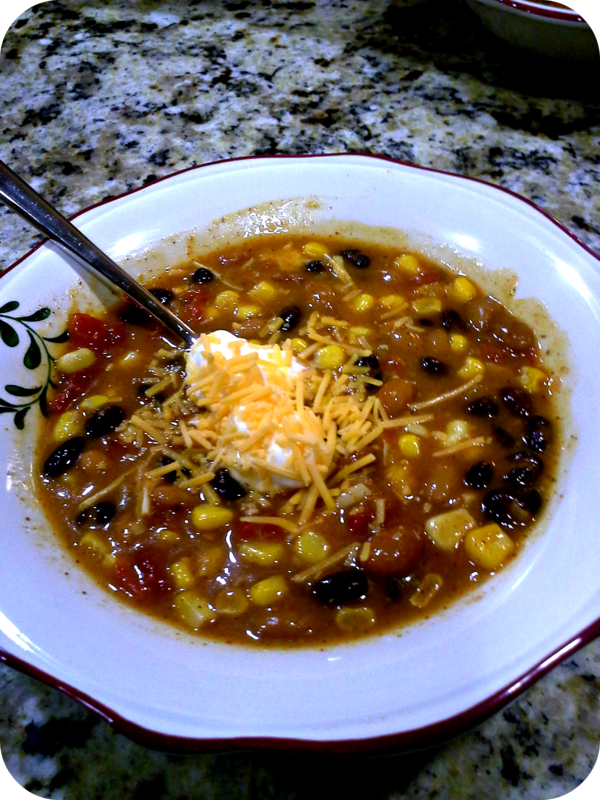 We are all looking for easy, delicious, healthy, and cheap ways to feed our families! 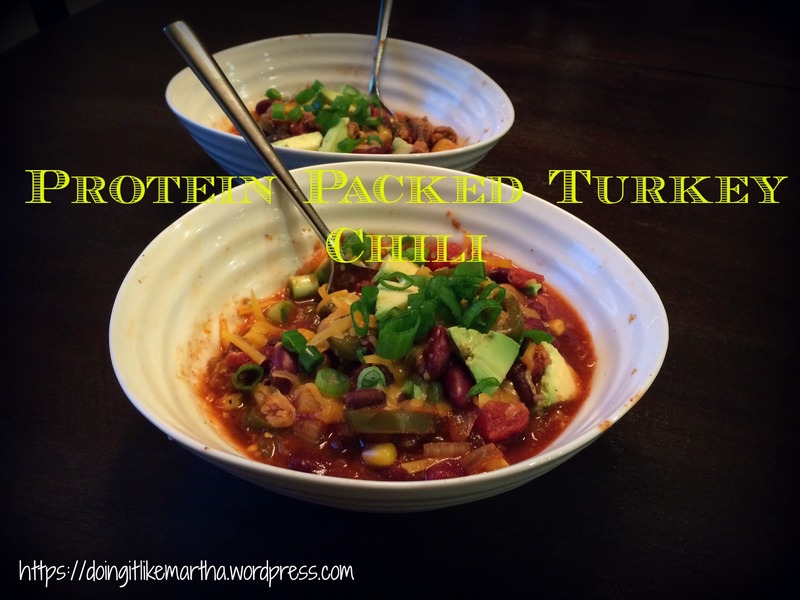 I came across this recipe and it was DEFINITELY worth making, it was the easiest thing I have ever made and it was full of flavor! I made threw the ingredients into a pot before my son went down for a nap, and put in the fridge. When we got home from our errands I just put the pot on the stove to heat for 15 mins, and it was the EASIEST thing ever! 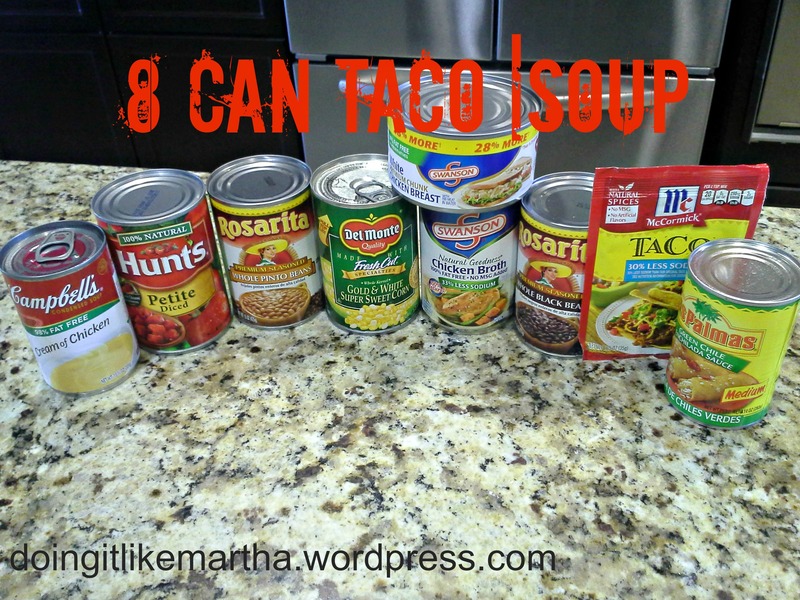 I LOVE 8 Can Taco Soup now, and Im sure you will too! * You could use shredded rotisserie chicken meat if you want a meatier soup, I will do this next time. Serve with tortilla chips. Garnish with sour cream, cheese, cilantro, red onions etc. The best part of this is, its super cheap and it freezes well!